This clinically focused book aims to cover for the first time all of the neurological aspects relevant to the diagnosis and treatment of spinal cord disease. Furthermore, innovative neurorestorative therapeutic strategies – aiming for repair of the damaged spinal cord and/or reorganization of the remaining nervous system – with significant potential for translation into clinical routine are presented. The book covers a comprehensive list of topics, including epidemiology, neuroanatomy, etiology of compressive and non-compressive spinal cord injury, imaging, neurophysiology, neurological sequelae, and complications with emphasis on dysfunction of the autonomic nervous system. Both clinically established and preclinical therapies are discussed in detail. 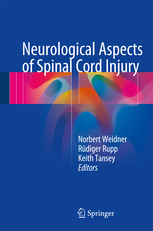 The book is suited for trainees and practicing clinicians including neurologists, spine surgeons, rehabilitation specialists, neuroradiologists, and occupational/physical therapists; it will also be of value to neuroscientists involved in research into spinal cord disease.